One of the most beautiful works of art I have ever seen! This anime was well made and stays true to the manga. They do such a good job at creating this world and immersing you into the fantasy world. I can’t wait for the next season and the continued manga. This is my favorite anime, though I watched it in sixth grade and some things in here sixth graders may find disturbing. I'm just a dark exception. This anime is filled with little cute things, as Elias doesn't really understand emotions, and she teaches them to him. He throws tantrums, like a little kid, and she is always there to help. This anime shows what being kind really means, when your in pain, you still help your enemy. 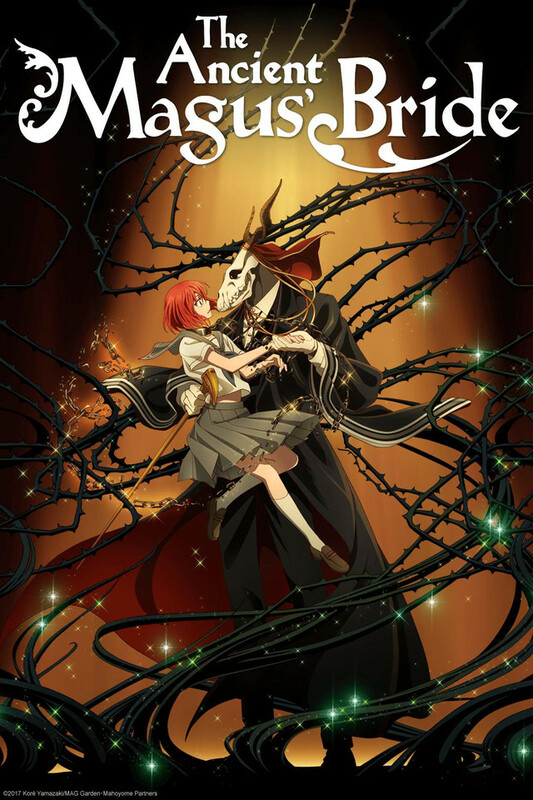 The Ancient Magus' Bride taught me how to be a better person, surprising since this is a television show, but I would recommend this to anyone. 1. Oh, you're working late I guess. Is tomorrow your day off? What are you going to do then? 2. Do you rest twice a week? 3. That's right. You know simple words since you know Idols. Yeah it's hard to say isn't it? 5. Don't think of gifts as burden. I sent many gifts to my Japanese friends, too. We gifted each other, and it was fun. Also, I can let my foreign friends know about cultures. my fav of the year!! I absolutely love this anime. It's got such an understated aesthetic that you don't find in the average anime these days. The main character is fragile but also strong in her convictions and her supporting cast all help to solidify her personality. The story arcs all have meaning; there are no fillers or irrelevant characters who are introduced then go away. you get the feeling that all the episodes are building to some inevitable conclusion. I'd give it 1 million stars if I could. Amazing action fantasy and romance in one! One of my favorites! So much beautiful imagery, creatures, and story. Wonderful! I love the trio dinamic, and the back stories that come with it. I very much hope they continue with more. There are a few things that I think could be better explained. But it’s wonderful, and leaves a bit for the audience to put in their own imagination as to how things are. Overall this show has unique characters and back stories for these characters. Animation is stunning and makes it hard to look away. The main problem is that for each question you have answered, it raises another that never gets answered. The characters and character growth, the lessons purveyed throughout each episode, the music, and everything about the animation (as stated in the title) is Studio Ghibli quality in every episode. It's certainly not a childish love story, however. It, at times, can be haunting and nearly intimidating because of a strong, dark presence in one of the main characters that, really only adds another enigmatic layer and sense of mystery to the anime as a whole. It's in my Top 5 favorite animes of all time. This anime is so beautiful but the more you watch it, the more you become obsessed with it. Finished it in 3 evenings and it's now in my top 5 favourite animes. By no means do I think this is bad, but as far as pacing, it is exceptionally slow. I'm not looking specifically for some action packed shonen, but if you watch this one, let it be because you enjoy the breathtaking scenery, and an excellent fantasy vibe building an interesting "wish I lived there" world. 4-5 episodes in, I was far from hooked as far as plot was concerned, though that is around the point where conflict at least starts peeking through a little more. Like I said, not bad, just might be bad for people looking for closure from each episode. It's the Werner Herzog production of the anime scene. This made me laugh, cry, angry, sad, and laugh and cry.... You get the idea. 10/10 would highly recommend first time anime watchers to watch. It has a lot of peaks and valleys in emotions for viewers. The story starts with a rush of sadness and then slowly gets happier only to wreck you with more sad story lines. It will have you hooked from the first episode.